No lettuce allowed in this salad. 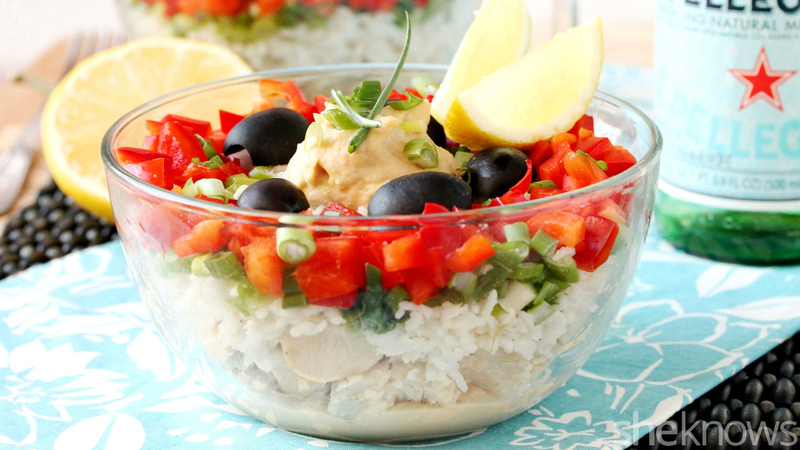 It’s a meal in a bowl with fresh veggies, chicken, rice and lots of lemony flavor. Layer it up with this beautiful salad that can be made ahead of time and stored in the fridge right up until dinner or lunchtime. It’s easy to make by just adding one layer at a time of beautiful color and delicious taste. I really like how light yet filling this salad is, and the taste of fresh lemon is wonderful. I like to dig down to the bottom layer to get some of the hummus along with the chicken and then top my spoon off with the veggies to get a bite of everything all at once. It’s one of those dishes that tastes great when eating the ingredients together in each bite. Feel free to replace the lemon-garlic chicken with another kind of meat you might have left over in the fridge. 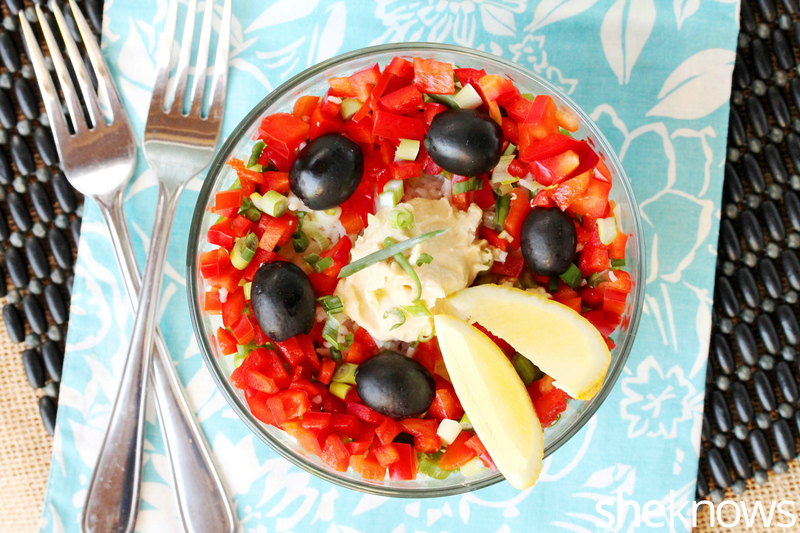 So change things up a bit, and give this beautiful layered salad a try for dinner or lunch today. A nontraditional salad made in beautiful layers of hummus, cubed chicken, rice with lemon, green onion and bell pepper and then topped with more lemon juice. In a medium-size bowl, prepare the marinade for the chicken by adding the lemon juice, olive oil, garlic, salt and pepper. Whisk together. Add the chicken, and let marinate for about 10 minutes. Remove the chicken from the marinade, and lay it out on a small cookie sheet pan with sides. Bake until thoroughly cooked (about 20 minutes, depending on the size of the chicken breasts). Let cool, and then cut into cubes. Set aside for a moment. In a medium-size bowl, prepare the rice by adding the cooked rice, lemon juice, salt and pepper. Stir together, and set aside. 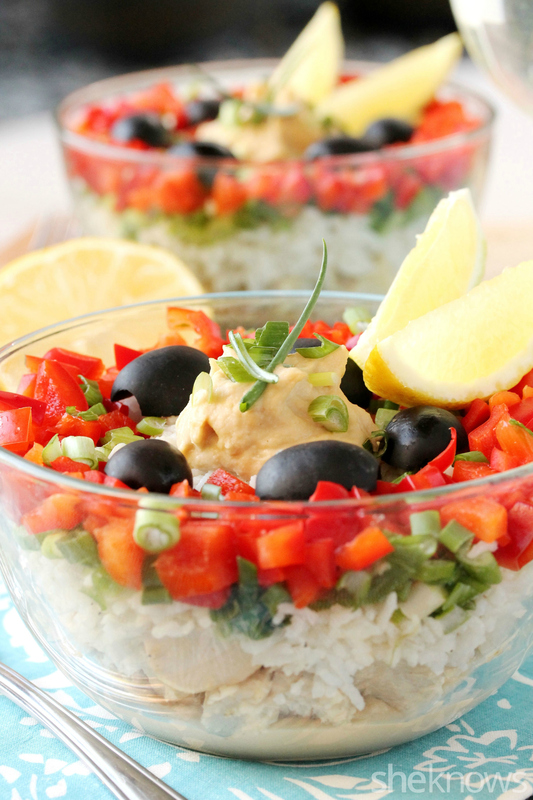 Into 2 glass serving bowls (or 1 large glass serving bowl), add a layer of hummus. Next, add a layer of cubed chicken. Then add a layer of rice. Top with a layer of green onions, and add a layer of red bell pepper. Garnish with a dollop of hummus and black olives. Cover with plastic wrap, and let chill in the fridge until serving. Just before eating the salad, squeeze the lemon juice on top and/or add a light drizzle of your favorite salad dressing.